Every year Best Colleges partners with Campus Pride — a nonprofit organization that seeks to build LGBTQIA+ supportive campuses — and rank the top colleges in every state. College Choice ranked UW-Eau Claire No. 3. University efforts to help LGBTQIA+ students include allowing students to choose their preferred pronouns when providing demographic information for the university. Students can also choose to list their gender identity and sexual orientation when applying for housing on campus. The Karlgaard Towers Hall will host a floor specific for LGBTQIA+ students once the hall is renovated in the fall of 2019. “When LGBTQ students come here, they are afraid of being paired with someone that is anti-LGBTQIA+,” Jorgenson said. UW- Eau Claire student, and recent transfer, Cas Henthorne who identifies as asexual, said she is proud of transferring to a university that is so welcoming. Henthorne is not the only student who feels this way. Fellow UW-Eau Claire student, Madeline Moltzan, has had some negative experiences on campus. Moltzan said she had one of her most homophobic experiences in a class, something she wont ever forget. Besides some of the homophobia Moltzan has received in the classroom, she said she feels privileged to attend such an inclusive university. The Chippewa Valley LGBTQIA+ Community Center, previously located in Banbury, expanded with a move to Oxford Avenue in Eau Claire last fall. Jason Bennet-Hardy, president of the center’s board, said the center is focusing on offering more support for transgender people and LGBTQIA+ teenagers. Their next goal is being able to offer support to anyone who walks through their doors. Apart from the support group and resources they provide, the center holds events in efforts to try and bring the community together, Hardy said. Their biggest event is the annual Pride Days that occurs in June. This year, Pride Days will be held in Phoenix Park and Hardy said they anticipate the largest numbers of attendees this year due to its centralized location. Jamie Utphall, the education pillar facilitator for the Safe Spaces Coalition of the Chippewa Valley, said the organization will station a booth at the Pride Days to show support. 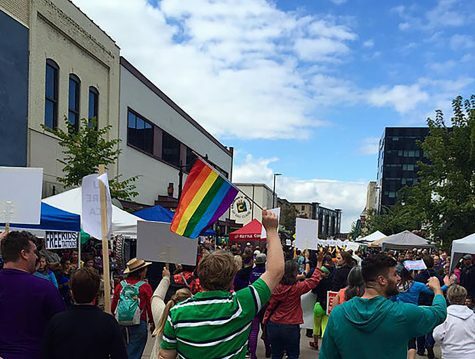 The Safe Space Coalition focuses primarily on identifying businesses and organizations around the Chippewa Valley that are LGBTQIA+ friendly. The coalition lists medical providers, alternative medicine, legal and social services on its website. The list of providers has grown, Utphall said, but he would like to see other types of providers like hair stylists, dentists and massage therapists added as well. Beyond Pride Days, the Safe Space Coalition and the Community Center are also partnering this year to sponsor Queer Prom for high schoolers. Upthall said they have partnered with the Aids Resource Center of Wisconsin in past years, but they were unable to for 2018, so the community center stepped up and offered to partner with the coalition. Moltzan has not only felt the homophobia on campus, but also in the community. While she doesn’t feel it everywhere, there are certain places and things she is afraid to do with her partner because the negative reaction they would receive. Utphall applauded the university for being rated number three, but also said she is aware that there is still work to be done. For instance, the community lacks safe spaces, according to surveys in which the coalition surveys LGBTQIA+ members. Utphall also said the coalition wants to update their data collection methods to learn more about LGBTQIA+ people of color in the community. The atmosphere of the LGBTQIA+ community in the Chippewa valley has changed over time, Utphall said. Jorgenson — like Utphall — feels the institution and the community have made positive changes, but still have strides to take.